President Donald Ramotar on Monday kept to his much anticipated promise and prorogued the Parliament but the 65-seat National Assembly could very well still meet later in the afternoon because the Speaker Raphael Trotman has not received a copy of the Official Gazette of the proclamation. Trotman told Caribbean News Desk that he was not ruling out going ahead with a sitting of the House if he did not receive a copy of the gazette. A spokeswoman for A Partnership for National Unity (APNU) said their 26 parliamentarians would still be going to the Assembly Monday afternoon at 2 PM. In an address to the Nation, the President defended his decision to suspend Parliament for up to a maximum of six months. "Some may ask why is it that my government has gone this Constitutional route and not go along with the debate. The answer lies in the practical choice between an atmosphere of confrontation, as the no confidence motion debate would fuel, or that of possible accommodation, as a prorogued Parliament can facilitate, if there is a genuine intent on all sides." 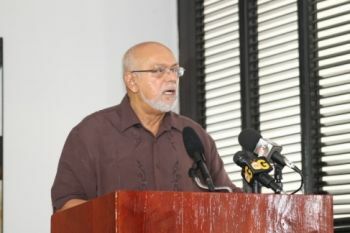 Word of the suspension of the Parliament came just hours after the President consulted with the Chairman of the Guyana Elections Commission (GECOM), Dr Steve Surujbally. The meeting with Surujbally was aimed at getting an update on preparations by the election management body for General and Regional Elections before the end of January 2015 as well as progress towards the holding of Local Government Elections during the second quarter of 2015. Fellow Guyanese, in my address to you on November 4, I indicated our desire for the National Assembly, in its post-recess sittings, to deliberate and give priority to important matters relating to the development of our country and the future of all of our people. I also extended a hand to the Opposition for us to put the nation’s business first rather than political gamesmanship. I further advised that should I be provided with reasons to believe that the Parliamentary Opposition intends to disrupt Government’s business by forcing a debate on their No Confidence Motion, I resolved to respond immediately by exercising my Constitutional options to either Prorogue or Dissolve Parliament paving the way for holding of General Elections. Consistent with my earlier position and in accordance with powers conferred on me by Article 70 (1) of the Constitution of the Republic of Guyana, I earlier today issued a Proclamation proroguing the 10th Parliament. Fellow Guyanese, my decision to exercise this constitutional option was not taken lightly, but it was the sole recourse that was left to me to ensure that the life of the 10th Parliament was preserved. It is no secret that the Parliamentary Opposition parties had, at every conceivable opportunity, made known their clear intention to have their motion of no confidence against my Government debated instantly at the first post-recess sitting which was called for today, November 10. Their one-seat majority in Parliament could only mean its passage and the immediate irreversible dissolution of Parliament. 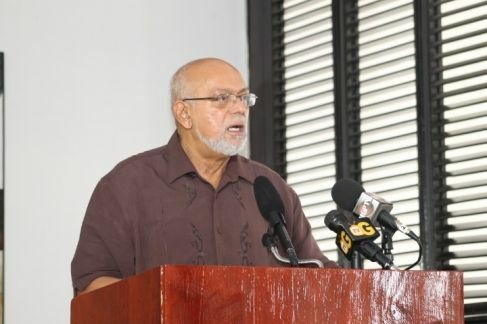 My appeals to return to normalcy, to constructively address the many important issues confronting us in Guyana, appear to have fallen on deaf ears. The Opposition in Parliament intends to end the life of the 10th Parliament with immediate effect, dashing all hopes for urgent attention to issues relating to economic growth, social services and yes, the holding of Local Government Elections. Some may ask why is it that my government has gone this Constitutional route and not go along with the debate. The answer lies in the practical choice between an atmosphere of confrontation, as the no confidence motion debate would fuel, or that of possible accommodation, as a prorogued Parliament can facilitate, if there is a genuine intent on all sides. I also want to assure all that my decision ensures that the life of the 10th Parliament is preserved up to a maximum of six (6) months, as permitted by the Constitution of Guyana. I pledge to you, to have my administration use that time during the period of prorogation to continue to engage the Parliamentary Opposition in constructive ways, in addressing the issues confronting Guyana. It is, however, my genuine desire to have the prorogation of the 10th Parliament ended sooner were my Government and the Opposition to reach an agreement for a return to normalcy. Further were these entreaties of cooperation by my government to be unsuccessful, I would then take the necessary steps for the holding of early General Elections so that the democratic will of our people can be freely exercised. Fellow Guyanese, during this period your Government will continue to attend to the provision of basic goods and services. Your Government intends to abide strictly to the Constitutional provisions relating to this period. I will not allow any interruption of the stability and progress of our nation. Further, we will be keeping all stakeholders abreast of developments. Fellow Guyanese, I have taken this step with the hope that the time gained would be used for the benefit our people. I wish to appeal to all for political maturity and the exercise of good judgment to put Guyana, our blessed nation, and, its people first. you are so wrong is such a better place under this PPP government the pnc under burhnam/hoyte was dictatorship !! !